Background: Fetal echocardiography is a well established sensitive tool to diagnose congenital heart disease (CHD) in utero. One of the determinants of effective utilization of fetal echocardiography is its awareness in the general population. The present hospital based study was undertaken to assess the awareness of the need for fetal echocardiography amongst Indian parents. Methods: One thousand one hundred and thirty eight consecutive parents who visited the pediatric cardiology outpatient department of a tertiary care centre over a period of two months were asked to fill up a questionnaire that included their demographic data, educational status, history of CHD in children, awareness of fetal echocardiography and source of information and timing of fetal echocardiogram if performed. The data was categorized and awareness was noted in different groups. Results: The awareness in the study population was 2.2%. Awareness was found to be similar across the study population irrespective of the demographics and high risk status of the parents. Conclusions: The awareness of fetal echocardiography, an important tool in reducing the incidence of complex CHD, thereby impacting public health, is alarmingly low in the population studied. Appropriate action to increase awareness of fetal echocardiography needs to be looked into. Whether fetal echo is being utilized to its maximum benefit in our country remains unknown. With this background, we conducted a hospital based prospective study to assess the awareness of fetal echocardiography in the population. We conducted a prospective observational study at a tertiary pediatric cardiac centre in India which was approved by the ethical committee. All the parents visiting the pediatric cardiology outpatient department between August - September 2011 were briefly described about the purpose of the study. All the parents who agreed to participate were included in the study. None of the parents declined to participate in the study. Either of the parents or both (when available) after mutual discussion amongst themselves filled up the questionnaire [Appendix]. The questionnaire included demographic details and educational status of the parents. The place of residence was defined as rural or urban based on the definition given by government of India census 2011. Educational qualification was classified as (a) no schooling (b) schooling (c) graduate (d) post graduate. Socioeconomic status of the parents was not included as most of the parents were not forthcoming with the information. One thousand one hundred and thirty eight parents who participated in the study were divided into two groups. Group A: Parents who had at least one child with diagnosed CHD. Group B: Parents who did not have a child with diagnosed CHD. Information was collected about their awareness of fetal echocardiography and whether they had undergone fetal echocardiography. Those who were aware of fetal echocardiography were asked about their source of information. The timing of the test done was also noted. Of the 1138 parents who participated in the study, 84% (951 parents) were from urban area. Demographic details were not clear in 14 patients. Educational qualification was available in 626 parents amongst whom 160 (25%) had no schooling, 248 (40%) had studied up to higher secondary school, 163 (26%) were graduates and 55 (9%) were post graduates. Group A included 1097 parents and group B had 41 parents. Twenty five out of 1138 parents (2.2%) were aware of fetal echocardiography. Mothers who became aware of fetal echocardiography subsequently after filling up the questionnaire were not considered to be aware of fetal echocardiography. 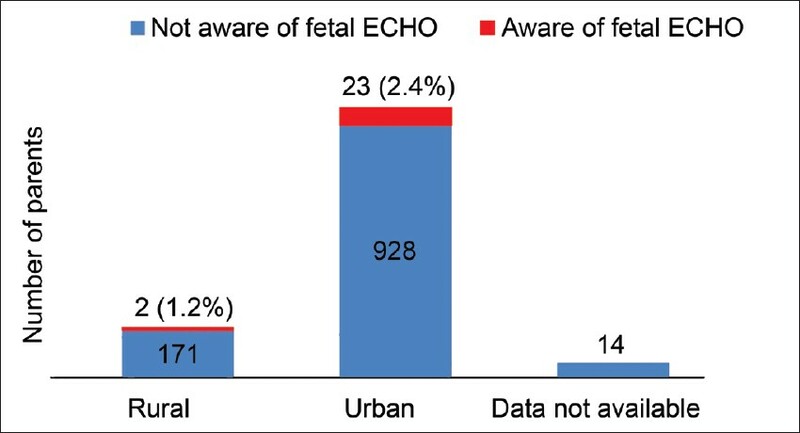 Amongst the 951 parents from the urban area, 23 parents (2.4%) were aware of fetal echocardiography. Out of 173 parents from rural area, 2 (1.2%) knew about fetal echocardiography [Figure 1]. Of the 25 parents who were aware of fetal echocardiography, educational status was available only in one parent. 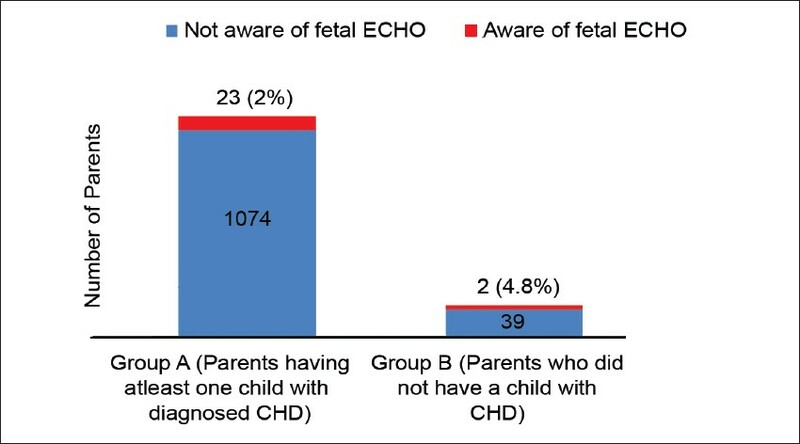 In group A, 23 out of 1097 parents (2%) were aware of fetal echocardiography. In this group, 13 out of 177 parents who had a subsequent child after the diagnosis of CHD was made in the previous child were aware and had undergone fetal echocardiography, whereas 10 out of 920 parents who did not have a subsequent child after the diagnosis of CHD was made in the previous child were aware of the test. In group B, 2 out of 41 (4.8%) parents were aware of fetal echocardiography and had not got the fetal echocardiography done [Figure 2]. Those who were aware of fetal echocardiography obtained the information from their obstetricians (17 cases), pediatricians (3 cases), cardiac surgeon (1 case) and media and other sources (4 cases). Of the 13 mothers who underwent fetal echocardiography, only 4 got it done prior to 20 weeks of gestation. CHD, though a disability present at birth, may not be readily apparent and may be missed at birth. Twenty five percent of the neonates with complex CHD are discharged from the hospital after delivery undiagnosed. Several of these infants who come for treatment have high peri-operative mortality and morbidity due to late referral. Hence, ensuring early referral of neonates with CHD by detecting them prenatally is expected to make a significant improvement in the present scenario. In the current era, when the field of fetal cardiology is considered promising and treatment of CHD has become standard in India, it would be interesting to know whether the awareness of the availability of fetal echocardiography is sufficient in the general population. To our knowledge, there are no studies looking at the awareness in the community in India. Although our study did not look in to the reasons for poor awareness, we could speculate into the possible causes behind the dismal awareness in our country. Many pregnancies are still not being supervised by obstetricians and hence regular scans which are considered a norm now may not be done for them. Financial constraints may result in suboptimal utilization of whatever resources are available in our country. There could be deficiencies even amongst the health professionals including lack of clarity about the role of fetal echocardiography and when and where to refer pregnant mothers. Due to wide mismatch between the number of patients and available medical personnel in our country, not much time is spent counseling the parents about the need of the test when an opportunity is available. Besides, there are limited number of training programmes focused on fetal echocardiography for radiologists and obstetricians to increase the suspicion of CHD during their routine obstetric scans. And finally, when CHD is not considered a priority by the most Indian governments and health care faculty, it is not surprising that the public awareness of its "early detection and reduction in prevalence" is lacking. To increase the awareness of antenatal diagnosis of CHD, one of the most important steps would be to increase the awareness in the general population using various communication channels like media and by displaying posters / handing brochures in the outpatient departments. Obstetricians must be sensitized to the fact that the major proportion of prenatally detectable cases occur in a low risk population. Hence, it is important to include imaging of the outflow tracts in addition to the four chamber view during routine scan which has shown to increase the detection rate of CHD. The obstetricians should be trained to suspect heart disease e.g. viewing of "crossed great arteries" etc. and offer appropriate timely referral when needed. This study revealed a startling gap in the knowledge about fetal echocardiography and its utility in India, even among parents of children with heart disease. Steps to create public and health care providers awareness is of the essence. Do you have a child with diagnosed congenital heart disease? Do you have a subsequent child after the diagnosis of congenital heart disease was made in your previous child? Do you know of any test to detect heart disease during pregnancy? Do you know about fetal echocardiography? Did you undergo fetal echocardiography? How did you know about fetal echocardiography? When did you get the test done? 2. Allan LD, Sharland GK, Milburn A, Lockhart SM, Groves AM, Anderson RH, et al. Prospective diagnosis of 1,006 consecutive cases of congenital heart disease in the fetus. J Am Coll Cardiol 1994;23:1452-8. 3. Bonnet D, Coltri A, Butera G, Fermont L, Le Bidois J, Kachaner J. Detection of Transposition of the great arteries in fetuses reduces neonatal morbidity and mortality. Circulation 1999;99:916-8. 4. Khoshnood B, De Vigan C, Vodovar V, Goujard J, Lhomme A, Bonnet D, et al. Trends in prenatal diagnosis, pregnancy termination and perinatal mortality of newborns with congenital heart disease in France, 1983-2000: A population-based evaluation. Pediatrics 2005;115:95-101. 5. Mahle WT, Clancy RR, McGourn SP, Goin JE, Clark BJ. Impact of prenatal diagnosis on survival and early neurologic morbidity in neonates with hypoplastic left heart syndrome. Pediatrics 2001;107:1277-82. 6. Simpson JM. Fetal arrhythmias. Ultrasound Obstet Gynecol 2006;27:599-606. 7. Daubeney PE, Sharland GK, Cook AC, Keeton BR, Anterson RH, Webber SA. Pulmonary atresia with intact ventricular septum: Impact of fetal echocardiography on incidence at birth and postnatal outcome. UK and Eire collaborative study of Pulmonary Atresia with Intact Ventricular Septum. Circulation 1998;98:562-6. 8. Comas Gabriel C, Galindo A, Martinez JM, Carrera JM, Gutierrez-Laraya F, de la Fuenta P et al. Early prenatal diagnosis of major cardiac anomalies in a high risk population. Prenat Diagn 2002;22:586-93. 9. Office of the Registrar General and Census Commissioner, New Delhi 110011, India. Available from: http://www.censusindia.gov.in/Metadata/Metada.htm#1. [Last accessed on 2012 May]. 10. Richmond S, Wren C. Early diagnosis of congenital heart disease. Semin Neonatol 2001;6:27-35. 11. Saxena A. Congenital heart disease in India: A Status Report. Indian J Pediatr 2005;72:595-8. 12. Fesslova V, Brankovic J, Lalatta F, Villa L, Meli V, Piazza et al . Recurrence of congenital heart disease in cases with familial risk screened prenatally by echocardiography. J Pregnancy 2011;2011:368067. 13. Koivurova S, Hartikainen AL, Gissler M, Hemminki E, Sovio U, Jarvelin MR. Neonatal outcome and congenital malformations in children born after in-vitro fertilization. Hum Reprod 2002;17:1391-8. 14. Bahtiyar MO, Dulay AT, Weeks BP, Friedman AH, Copel JA. Prevalence of congenital heart defects in monochorionic/diamniotic twin gestations: A systematic literature review. J Ultrasound Med 2007;26:1491-8. 15. Stümpflen I, Stümpflen A, Wimmer M, Bernaschek G. Effect of detailed fetal echocardiography as part of routine prenatal ultrasonographic screening on detection of congenital heart disease. Lancet 1996;348:854-7. 16. Ogge G, Gaglioti P, Maccanti S, Faggiano F, Todros T. Prenatal screening for congenital heart disease with four chamber and outflow-tract views: a multicenter study. Ultrasound Obstet Gynecol 2006;28:779-84.